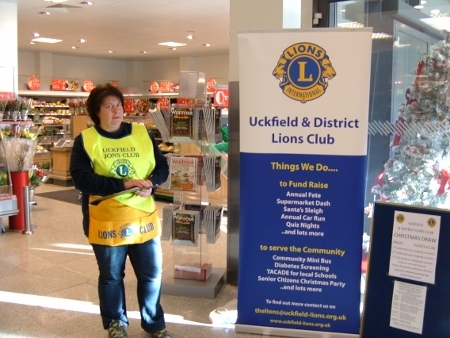 Fund raising never stops for Uckfield Lions. Annual events such as the Quiz Nights, the Easter Egg Raffle, Lions Day, Fun Run, Classic Car Rally, the Lions Santa Sleigh & Christmas Supermarket Raffle are all well established. The Lions Secondhand Bookshop raises money all year round. In July 2016 with the aid of a Government grant & donations from local organisations & individuals, the Club took delivery of a brand new 14 seater Mercedes Mini-Bus equipped with a wheelchair lift and space for 4 wheel chairs when required. The Uckfield Lions Community Mini-Bus is widely used by many different organisations around the Uckfield area, such as the Uckfield Housebound & Friendship Club, the Blind Club, community groups, guides, scouts & football clubs. This form of 'service' from the Lions is the only way they can ensure their members can be transported to meetings and for outings. It is also well used by the Lions for their summer cream teas & trips around the countryside and transporting people to and from various events. It is available to hire by organisations, providing their own driver where possible. Drivers are asked to complete a named driver form for acceptance onto the Insurance policy. Uckfield Lions may be able to provide drivers by arrangement. The current standard rates of hire are £1.00 per mile driven, which includes fuel & insurance, with a minimum hire charge of £15. The community minibus is run on a not for profit basis. For bookings, please contact Lion Barry on 07583 025588 dupleman@gmail.com & for further information about becoming a volunteer driver. 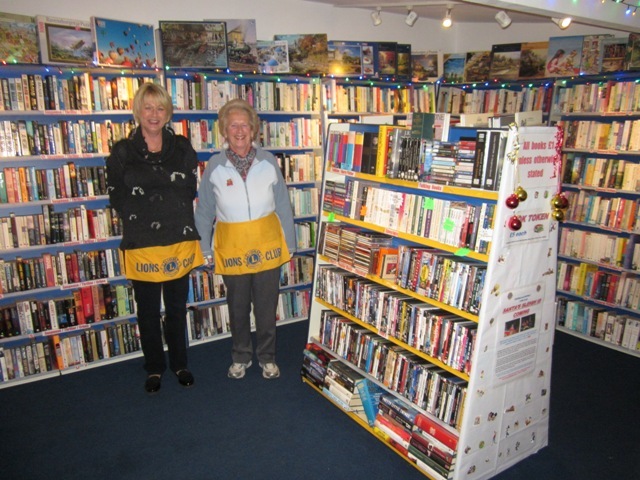 Volunteers required to help in the shop, sorting books & serving customers. 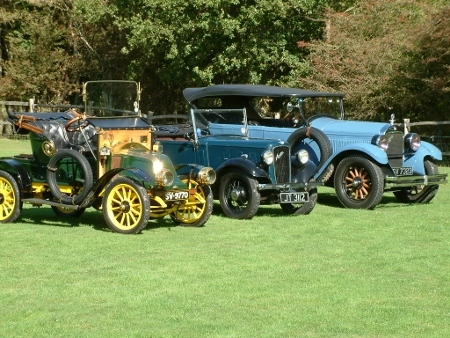 In 2003 Uckfield Lions held their first Classic Car rally. The event, held in September each year, is now a major day in the Lion's calendar. Meeting at about 10am at The Half Way House Inn on the Lewes Road, Uckfield, & after a cup of coffee, the cars then undertake a pictorial run around the Kent & Sussex countryside of about 50 miles to finish back at the Halfway House Inn for lunch. There is also an arranged coffee stop on the route for those who wish to stop. All the classic cars are parked in the field behind the pub where owners & visitors can meet & view the cars. A pig roast is then available together with a refreshing drink from the bar. Last year the Classic Car Rally was held on Sunday 24th September 2017. This year the car rally will be on 30th September. Twice a year Uckfield Lions organise a free Diabetes Testing morning. One is held in Uckfield on the first weekend in June & the second in Heathfield later in the year. Come along & take advantage of our free test which are performed by qualified personel using a drop of blood to measure the blood sugar level. If the nurses find a reading out of the normal range they will recommend a follow-up with your GP for a more acurate test. Last year Diabetes Testing in Uckfield High Street was on Saturday 3rd June with the Heathfield Diabetes Testing on 4th November. This year there are two Diabetes Testing days in Uckfield, one at the Belmont centre was on 7th April combined with Prostate Screening & another Diabetes Screening at Bridge Cottage in the High Street on 2nd June. 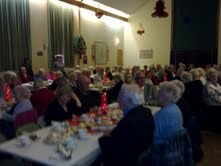 Every December, Uckfield Lions organise a Christmas party for senior citizens at Nutley Village hall. Invitations are sent out around October time & around 120 guests enjoy an afternoon of entertainment, followed by afternoon tea. Transport can be provided for a limited number of wheelchairs & for people unable to arrange their own transport. Last year the party was held on Saturday 2nd December. See latest news page for past years press releases. This year the party will be on 1st December. Lions have supported the Kent and Sussex Air Ambulance for a number of years, and indeed the Lions of Uckfield have given donations from our Charity Account on several occasions. At the beginning of 2014 our District, which covers Kent Sussex and Surrey an agreement with them guaranteeing we would raise funds of at least £250, 000 over 10 years to enable them to upgrade to have night flying capability. This involved the provision of special night vision headsets for the pilots, the fitting of additional equipment in the helicopters, the funding of pilots and medics for night time cover, and the provision of landing lights at the hospitals they service. In the first nine months we have raised and given them over £150,000 and the rate of funding is not slowing down. The helicopters are now night functional and this has resulted in an operational success factor increasing by over 100%. Monthly Quiz nights are held at 8pm on first Tuesday of each month at the Ringles Cross pub, Uckfield. Cost is £2 per head, cash prizes. Why not come along with a team of 6 people or just on your own to make up a team. Every year Uckfield Lions hold a 10K Run starting at Uckfield Rugby Club & around Buxted Park. The route takes you past fishing lakes, Buxted Church & the Buxted Hotel. The run this year was held on a very hot Sunday 8th July at the Uckfield Rugby Club..
Every year Uckfield Lions hold their Lions Day on Luxford Field, Uckfield & have stalls at other local fetes. There was Punch & Judy, refreshments, childrens activities, stalls & car boot. As many of you know all profits from Lions events are put back into good causes within the local community, many of you will have received donations from Lions in the past. 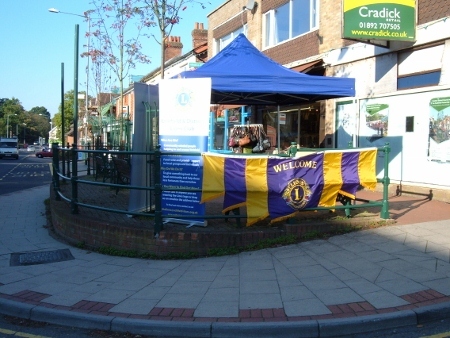 Uckfield Lions also have a stalls at other local fetes, including Nutley & the Uckfield Festival. Message in a Bottle & Message in a Wallet. Have you got a bottle or know of someone who should have one? Bottles are free & can be collected from pharmacies, doctor's surgeries, any Lion Member or the Lions bookshop at Olives Yard, High Street, Uckfield. This simple but effective scheme provides vulnerable people or people living on their own with vital life saving information in a common place, the fridge, where it can easily be found in the event of an emergency. This will save the Emergency Services valuable time & money. Two labels, one on the inside of the front door and the other on the fridge, alerts the Emergency Services that this information is available. The information stored in this readily identifiable container includes personal details, doctor’s name and telephone number, a brief description of any medical conditions, allergies, family contact details and Repeat Prescription location. The same facility is now available as Message in a Wallet. This additional scheme was introduced by Uckfield Lions in 2017. Details are entered onto a small card & kept with a person in their wallet or purse. The Lions Santa Sleigh tours Uckfield & surrounding villages throughout December & is in Olives Yard, just off Uckfield High Street on Late Night Shopping. Money raised goes towards supporting various charities & good causes. Santa gives out presents to all the young children who come out to see him. Late Night Shopping this year will be on Friday 7th December with Santa in Olives Yard.